Taking care of your precast concrete forms extends their life and protects a valuable investment. It starts with day-to-day mainentance. Steel form problems can happen with poor cleaning or excessive use of wire brushes or sandblasting. They can also be damaged by vibrators. The selection of a good concrete release agent is another important aspect of form care. There are two main types of concrete releases. Diesel fuel, greases, used motor oil, etc. barrier type products provide a barrier between the form and the concree allowing it to strip. These provided a good release, but cause surface voids, staining, and over all poor finished appearance. They are harder to apply due to their higher viscosity. Reactive type are chemically active and contain compounds that react with the free lime in the concrete to produce a soap-like film between the form and the concrete. This type of release agent is the most widely used. They are only require a thin film to produce a stain-free, void-free concrete surfaces. Reactive type release allow the form to strip cleaner. Proper application of release agents is necessary for economy and for producing the best product possible and for minimizing form clean up. Another aspect of concrete form care is protection in storage when they are out of service between jobs. The forms need to be protected from rust and corrosion. Some use grease, diesel fuel, or release agent but a rust preventative is a beter choice. For your rust preentative know the quality of protection, length of protection, ease of application, and ease to remove. Formwork is a big investment for producers. Proper care insures product quality and extends their life. It will make your concrete business more profitable. A hollowcore precast concrete plank is prestressed concrete used in the construction of multi-story building floors. The concrete hollowcore method is popular in insect prone, coastal, earthquake and severe weather areas. It offers fast building assembly and lower material weight. The hollowcore slab has tubular voids extending the full length of the slab. This makes it lighter than a solid concrete floor of equal thickness. The reduced weight lowers transportation and material costs. They are typically 4 to 5 feet wide with thicknesses between 10 and 16 inches. Prestressed reinforcing steel wire rope provides resistance to bending moment from loads. The manufacturing process involves extruding wet concrete from a moving mold over a steel bed on which the form release application has dried. The continuous slab is cut by circular diamond saws to the length required. Factory production provides the advantages of reduced time, labor and training. Hollow core voids can be used for conduit or coated for use as a ventilation duct. Which concrete form substrates and finishes are best for your application? Considering what form substrate what form substrate material and what surface finish will be best for an application depends on the surface finish specified for the concrete, the number of form reuses the project requires, the strength and deflection characteristics of the substrate, price, and perhaps the thickness tolerances of a product—especially important for architectural concrete work. Choices for form substrates and surface finishes range from inexpensive CDX plywood that serves as both the substrate and the surface finish, to more expensive aluminum, steel, or plastic resin composite materials with exotic finished surfaces for multiple reuses.The latter may be the bargain compared to plywood when considering the per placement cost versus the original purchase cost. Which substrate and surface finish to use is driven by project requirements. If the forms will be reused 100 times, form panels should be purchased to meet the requirement. Refacing a form assembly halfway through a project causes delays and is expensive. Conversely, it isn't cost productive to invest in materials that can get 100 uses for a job that will only require 20. Plywood, steel, aluminum, and composite materials are used for both vertical and horizontal forming systems as a substrate material. Located behind these panels are an array of strong-backs, whalers, and trusses that also are made from wood, steel, or aluminum. There are many substrate material and surface surface finish choices choices in the marketplace, each each with advantages with advantages, disadvantages, and costs. The challenge is to select the right product for the product the job. For single-use applications, CDX plywood is probably the cheapest substrate material when the concrete finish doesn't matter. For example, the back side of a unique retaining wall section not in public view might be a good application for a single-use form. But be aware that CDX is designed for other purposes, has only 5 plys, and isn't rated for the pressures that concrete can impose. For repetitive work, better grades of plywood are necessary. They don't absorb as much moisture and help to reduce the concrete build up (laitance build) on the casting surface. These can be pre-oiled panels or substrate plywood panels with waterproof surface finishes. Most plywood for concrete forming is 7 ply, though there is some plywood available with more laminations. Although some 5-ply sheets are available, most contractors prefer 7 ply because they are stronger and have less deflection. Sheets are manufactured by either a one-or two-step process. Manufacturing a one-step sheet involves placing the overlay material and all the veneers with waterproof and boil proof glue in a hot press. The resulting panel has thickness tolerances of ± 1/32 inch. Two-step panel processing involves gluing the veneers in a press, repairing panel faces with poly-patch compounds, sanding the surfaces smooth to a tight tolerance, and then bonding the overlay surface to the panel in a hot press. These panels have thickness tolerances of ± 0.005 to 0.006 inch with no transfer of grain lines or knot holes to the concrete, making them a good choice for high-end, architectural concrete finishes. The first place deterioration starts on a wood panel is along the edges because water can easily enter and cause swelling. Manufacturers of overlay panels typically seal the edges with polymer products so every cut you make also should be sealed. Here are some of the wood substrate classifications available. B-back, oiled, and edge sealed (BBOES). Plywood panel surfaces are ranked as “A,” “B,” or “C.” Surfaces marked as “B” permit 20 to 25 knot holes and exposed grain on a 4x8-foot sheet. “Oiled” refers to the panel being oiled during the manufacturing process to allow for easier release from the concrete. “Edge sealed” means the panel edges are sealed at the factory to reduce moisture absorption. BBOES is typically made from either Southern Yellow Pine (SYP) or Douglas Fir (DF). SYP panels are less expensive than DF and usually are heavier. DF panels typically are better quality than SYP because moisture doesn't cause them to swell or move as much and they are almost always the panels used for overlay surfaces. All BBOES products will exhibit grain and patch transfer to the finished concrete. You can expect four to eight uses and the application of release agents is required before each concrete placement. Hardwood veneers on top of DF panels offer blemish-free surfaces with less moisture absorption. The wood for these veneers includes maple, oak, Brazilian, and Indonesian hardwoods. Used as overlay panels, they are cleaner and offer better adhesion for overlay resins. The typical substrate thickness of a steel panel is 3/16 to ¼ inch, but can be as little as 14 gauge for handset panels. With a life expectancy of several decades, or even a lifetime, deflection of these panels is minimal and create very smooth concrete surfaces. When using steel forms, designers usually are concerned more about panel joint and tie-hole locations than finish. Steel deck forms feature a steel frame, a plywood substrate, and a resin surface finish. Form manufacturers generally require thin-film, reactive-type form release compounds for good form release. Like steel, the aluminum in a panel serves as both the substrate and the finished surface. Standard substrate thicknesses range from 0.094 to 0.120 inch, but they can be more for gang form wall panels where greater head pressures are anticipated. The panels are much lighter than steel, are built to have little deflection under load, and can provide very smooth concrete finishes. When they are properly cared for, you can achieve more than 2000 uses. New forms must be “seasoned” (some manufacturers preseason them) to avoid a reaction between the aluminum and the alkali of the cement that results in a disfigured surface. Material that is factory applied to any given substrate is referred to as an overlay. Overlay panels are alkali resistant and minimize labor costs by reducing clean up time between placements. They are more resistant to moisture penetration—increasing resistance to cracking or “checking” as well—extending the life of the form. They also produce smooth concrete finishes. There are two categories of form surfaces with a resin impregnated paper: medium-density overlays (MDO) and high-density overlays (HDO). MDOs consist of a large family of phenolic resin impregnated overlays designed for use on engineered wood substrates. Easy field use combined with the ability to produce superior matt or architectural finishes make them a favorite choice for concrete contractors. MDO 1 step panels incorporate a layer of Kraft brown resin impregnated paper. The concrete surfaces produced by them are smooth with some grain and patch transfer. You typically can expect eight to 12 placements. MDO 2 step panels provide a smoother finish. Surface blemishes in the base panel are repaired and sanded before the resin impregnated Kraft paper is added. The result is a smooth matt finish that can handle 12 to 15 concrete placements. HDO form surfaces are especially good for high-gloss architectural finishes. Like MDOs, they encapsulate paper in resin, but the resin content in HDOs is higher—varying from 48% to 58%. There are two types of HDO. Paper and resin is placed on both sides of an engineered panel to minimize moisture penetration, thereby helping panels to stay flatter or balance the sheet. The expected usage is 20 to 35 concrete placements. Substrates are first glued, patched, and sanded to close even thickness tolerances. Then 48% to 58% resin impregnated paper is bonded to both sides. The least expensive version is a very thin melamine layer over particle board for limited-use application. The more durable version features 2-mil build ups that add both weight and expense to a form. But the number of reuses makes it worth the cost and finishes are architectural grade. These create perhaps the best overlay system of all—the only ones that can be applied over a metal surface. They are made with polyethylene and polypropylene, or mixtures of plastic materials. Nail holes and dents can be easily repaired. They are more expensive to purchase but with proper care and maintenance are reusable as many as 100 times. One substrate panel is built with foamed polypropylene sandwiched between thin sheets of aluminum or fiberglass with polypropylene surface finishes. Because there is no wood in the system, cleaning can be achieved in less time by using a pressure washer and 1000 reuses are possible. Urethane creates a hard, durable finish and concrete contractors sometimes apply them over inexpensive forms. But considering the cost of the material and labor to apply, this approach is perhaps not worth it. All surface finish products require the use of form release products and all forms manufacturers stress the need to use minimal amounts that won't affect surfaces adversely. Excessive amounts of release agents can cause a vacuum or sticking affect on some denser surfaces. Most of the recommended products react with the alkalinity of concrete to produce soapy films that break the bond between forms and concrete. Contractors sometimes make the mistake of choosing a form panel system based on initial cost. If they know they will need to reuse their panels 80 times on a project and choose a product that will only get 60 reuses, they will have to remove the panels from their form system and replace them in order to complete the job—this adds labor, job downtime, and new panel costs. There is a cost advantage to choosing a system that will complete all the placements. Calculate the total uses for a project and buy in order to complete the entire job with one purchase. Marcus M. Chase is senior vice president of market development and sales for MAXAM Industries Inc. He brings nearly 22 years of experience, with a special focus on wood and the concrete forming industry. He has either developed or assisted in development of new concrete forming panel technologies in high reuse, no oil, and LEED-compliant materials. Joe Nasvik is a senior editor for CONCRETE CONSTRUCTION magazine. You may see a specification for FSC panels. This refers to how the lumber was grown, farmed, or cut from native stands. In order to produce FSC panels, the manufacturer of the forms must be certified as well as the logging enterprise and all parties in the transaction. This is referred to as the “chain of custody.” Only a handful of mills are certified at this point but you will undoubtedly see more specifications for FSC products. Every time you cut a panel be sure to apply edge seal over the new cut. When you stack form sheets, stack them face to face. Don't expose form surfaces to the sun for long periods of time. Use a good form release product and apply it sparingly before each concrete placement. Clean form surfaces shortly after removing them after a concrete placement. Repair nail fastener holes and dents as they occur (few contractors do this). Grifcote CC-150-VOC is widely used for concrete form seasoning for optimal concrete release. 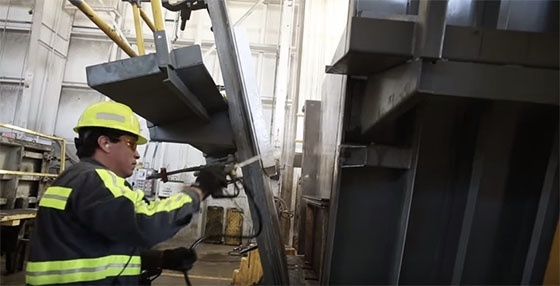 Spraying form release agents on mixers and equipment reduces labor and cleanup at the end of the day eliminating concrete adhering to the equipment. Published on Feb 24, 2017 - Learn how to properly apply form oil at your precast concrete plant. Spokesperson, "So Lynn, Why is form release application such a critical step in the production process?" Lynn, "It's so critical because it helps you in stripping product out of the form, you get a better overall finished product and it really preserves the life of your mold. As you can see behind me, we have a mold that was stripped earlier today. Before we talk about applying release agent, it’s important to know…"
Self-consolidating concrete (SCC) has been used to produce many aesthetically critical projects since its development nearly 20 years ago. Although mixes of various levels of strength and durability can be designed to generate smooth, defect-free surfaces, this does not ensure that the finished structure will be unflawed. Two outside influences can greatly affect the appearance of concrete. The first is forming materials—the most popular are steel and plywood. The second factor is release agents. Different types and brands of release agents (form oils) give varying degrees of surface defect. The method of application of these agents also plays a part in the final product appearance. SCC with an appropriate release agent yields defect-free surfaces. In 2003 we launched a study to evaluate the effects of form conditions on the finished surface of SCC. Two SCC mixes were developed that could produce a defect-free formed surface. One design was a “high fines” SCC (Mix 1 in the table), and the other used a stabilizer, or viscosity modifying admixture (VMA). Both were well-designed, stable mixes, verified by casting and testing samples. Both mixes also attained 5% ±1.5% entrained air content that met the industry accepted criteria for specific surface and spacing factors, exhibiting a very stable air matrix. Note that entrained air content does not affect the presence of bug holes; entrapped air—air bubbles too large to benefit the concrete—is what clings to the formwork. Entrapped air can be generated during the casting process (most bug holes appear near where a form is filled), or large air bubbles can be generated and trapped in the concrete because of the superplasticizer. The new-generation polycarboxylate-based high-range water-reducing (HRWR) admixtures often contain significant amounts of defoamer to reduce air entrapment, but this can wreak havoc on the entrained air matrix. Wood forms and metal forms will show significant differences in surface defects. Wood forms tend to produce fewer bug holes than metal because wood forms soak up excess release agent that has been hastily applied. Any small amount of extra oil on a steel form will react with the concrete mix and create small bug holes, perhaps better termed “pinholes.” Therefore, proper application is absolutely necessary. Steel forms require more attention to ensure a clean, smooth surface. Any defect on the form will create a blemish on the concrete surface. A form's cleanliness and smoothness greatly affect the appearance of the concrete surface. This simple, logical truth cannot be overstated when dealing with SCC. Forms should be as smooth as possible to allow entrapped air to move easily upward along the form system; they must be kept free of paste buildup and laitance, which prevent air and water pockets from traveling to the concrete surface. In our study, as paste built up on each form with subsequent castings, the concrete surface appeared worse. Scratches or gouges will hold air against the surface of the concrete. Any steel forms pitted with rust will cause blemishes, which at times produce more bug holes than are noticeable with vibrated conventional concrete. We also noticed that when the form skin had a lower temperature than the SCC, air voids smaller than usual were present. That occurred at approximately a 25° F temperature difference. Whenever you grind a “seasoned” steel form, you remove the protective barrier previously produced by the reactive form release agent. Rusted forms have negated the barrier that was in place. Once the form is ground, raw metal is exposed. The reactive portion of the form release agent, typically a fatty acid, has a natural affinity for metal. The fatty acid attacks the raw metal and forms metallic oleate, which acts as a protective coating. Subsequent applications of reactive form release agents are prevented from getting to the metal by the protective layer of metallic oleate, allowing the reactive portion of the form release to be available to react with the free lime on the surface of the concrete. This reaction forms a chemically inert metallic soap, which gives good release and allows free air to rise more easily to the surface on vertical walls. Until the form is seasoned, or the protective barrier is formed, the reactive portion combines with the metal, leaving nothing to react with the free lime. The steel forms used in this study were seasoned after cleaning and before further castings took place. That aided the finish somewhat but the pits left in the forming material by the rusting process trapped air voids, creating bug holes. Grifcote CC-150-VOC is widely used to season forms for optimal concrete release. Gifcote concrete release products are non-staining and ready to use with no mixing needed and offer many unique features to improve concrete separation from forms, pallets and molds. All Grifcote products are available in 55 gallon drums, 330- gallon totes or bulk tank wagons. All Grifcote Form Seasoning Concrete Release Agent products have indefinite freeze/thaw cycles. You don’t need to worry about Grifcote degradation due to temperature changes. Published on May 14, 2015 by the Science Channel. "A mix of limestone gravel, minerals and additives are mixed into a slurry. After a test sample is hardened and tested, workers pour it into pre-made molds."